Salt Lake City, UT – October is the time of year when skiers’ minds turn towards their winter trips. However, no one needs reminding that the winter of 2011-12 was one of the worst on record. 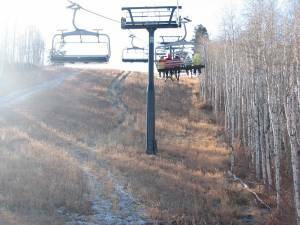 Snowfall was down across most U.S. ski regions and skier visits plummeted. In response, it appears that many skiers are playing it safe this year and waiting to see where the snow will fall before booking winter trips. 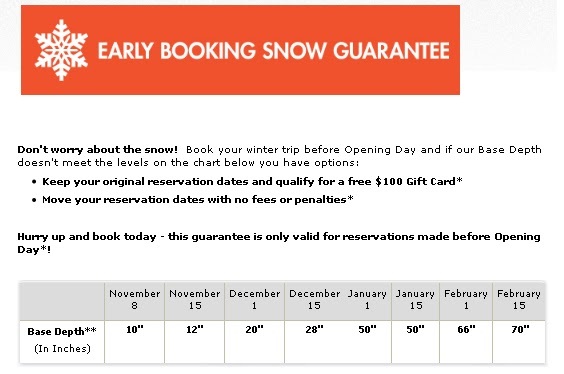 To counteract this trend towards later bookings, a number of ski resorts are introducing fantastic early booking discounts, many of which center upon some type of “Snow Guarantee.” The concept of a snow guarantee has become increasingly popular among resorts in recent years. The premise is simple. In essence, the resorts are saying, “We know you’re a bit gun-shy after last winter, but book now because we’ll have snow. If not, we’ll let you either cancel, switch your dates or somehow make it right.” Sounds great, right? Well, as always, the devil is in the details. There’s an old saying in the law, “a guarantee is only as good as the guarantor.” Luckily, in the ski industry most of the guarantors are large multimillion dollar companies. They will be able to back their guarantees. The key, however, is to closely read the fine print, because what you think of as meeting a certain minimum snow threshold may not be what the resort is actually promising. There can be a huge gap between the promise and a skier’s expectations. A quick Google search for “snow guarantee” returned more than 33 million hits. Clearly the trend towards promising good snow is a pronounced one, aided in no small part by large resort investments in snowmaking across the country in recent years. It’s easier to guarantee conditions if all you need is just cold, not cold and snow. The guarantees offered by ski resorts break down into two basic categories: (1) conditions guarantees and (2) snow guarantees. A conditions guarantee is a promise by the resort that the conditions on your particular ski day will meet your expectations. If not, the resort will refund your lift ticket if you meet certain preconditions (e.g. returning the ticket before a certain time). This article focuses on the second type of guarantee, the snow guarantee. A snow guarantee is broader because it applies to lodging, not just to a lift ticket. Generally, you have to show up and ski to benefit under a conditions guarantee. A snow guarantee, by contrast, is promise by a lodging provider, the resort’s central reservations center, the resort itself or a third party that the resort will have “snow” when you visit. The first key to understanding the value of a snow guarantee is to understand whether the guarantee is subjective or objective. A subjective guarantee leaves it up to you, the skier/consumer, to decide whether the conditions meet your standards. In contrast, an objective guarantee is premised upon the occurrence or non-occurrence of a certain easily measured independent metric. It’s a simple test. The simplest example might be whether the resort is open or closed – easy to measure and unquestionably objective. Either the resort is open or it isn’t. Alternatively, a guarantee might hinge on a certain percentage of the terrain being open. Be sure to note how the resort measures this percentage. In trails? In miles? In acres? 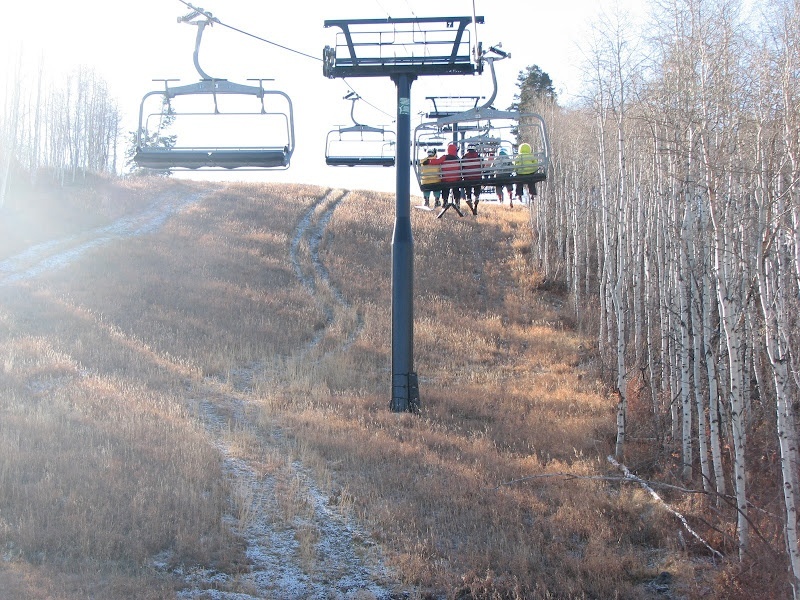 A resort could have 10% of its trails open, but only 1% of its terrain. To decide whether the guarantee is worthwhile, examine the metric. The resorts generally draft objective tests to lock visitors in with as little open terrain as possible. So assume the worst – that the resort barely makes the threshold. If you would be satisfied paying the price of the reservation to ski that resort with X% of its acreage/trails/mileage/base depth open, book. If not, maybe consider shopping around. It’s important to consider not only when and how the guarantee snaps into effect, but also what you get if it does. Some resorts will allow you to cancel your trip for a full refund. Such a policy is the most consumer-friendly. You’re free to find another resort altogether. Other resorts will simply let you rebook later in the winter. Keep in mind that just because a ski resort will let you switch your dates, that doesn’t mean an airline will. Factor airline change fees into the cost if you’re flying. Let’s look at two examples, Winter Park in Colorado and California’s Mammoth Mountain. Book a trip to Winter Park for arrival/departure between November 14 – Dec. 20, 2012. If our snow is not up to your standards, you can reschedule your trip to Winter Park for later this season. Notification of plan to reschedule must be made 48 hours prior to arrival (by 4 p.m. two days prior to arrival). The cost of your early season vacation will be applied to the later dates, difference in cost to be paid by guest. Rescheduling will be on a space available basis. Rescheduled trip must be used by April 21, 2013. Winter Park’s guarantee is subjective. Note the language, “If our snow is not up to your standards.” (emphasis supplied). On one hand, the subjectivity of the promise is great news. You can decide whether the conditions are as good as you like. On the other hand, you don’t get a refund; you have to rebook at Winter Park at some point later that winter. Depending on your situation, that may or may not be feasible. If you’ve booked during a school vacation, you’d rather switch destinations than weeks. Also, switching weeks might be easy if you’re driving, but if you’re flying, it might not be worth the exorbitant airline change fees. The first key issue with this promise is that you have to wait until the morning of the first night of your stay to determine whether the base depth exceeds the chart. It would be nearly impossible at that point to switch your reservation if you’re flying. Secondly, if you do switch dates, you’ll be subject to paying a higher rate later in the year if that time period is more expensive. Thirdly, the resort does not say that if you switch to a less expensive week, you’ll get that lower rate. Fourthly, the offer is not good over Christmas vacation week. Considering the difficulty, hassle, and expense of last-minute rebooking, a $100 gift card seems like the most likely compensation for low snow depths. In short, all guarantees are not created equal. Don’t assume that a guarantee means that if the snow is bad, you’ll get your money back. That is normally far from the case. Remember that guarantees that let you cancel your reservation entirely are the strongest. Read the fine print carefully and remember, their lawyers drafted that language to protect the resort, not you. Author David B. Cronheim, Esq. is the Chief Legal Correspondent for First Tracks!! Online, an attorney at Norris, McLaughlin & Marcus, PA in Bridgewater, N.J., and author of the ski law blog Ski, Esq. Please feel free to contact the author at DBCronheim@nmmlaw.com.